Why are we concerned with a marriage of food and drink? Quite simply, we consume both and often do so at the same time. The right drink can enhance a dining experience and the wrong drink can ruin an entire meal. While it's common to think about pairings for food and wine, that can be expanded to include cocktails, as well as beer. This can enhance any meal, from a formal dinner party to a casual backyard barbecue. There's a bit of science to it, but it's also not complicated, especially if you simply start exploring your options. There is a special knack for a successful food and drink pairing and it can get complicated. It gets even more so when working with cocktails because the flavors are more complex. However, the experience can be a lot of fun because the flavors are nearly endless and can produce some fantastic results. Many people tend to pair cocktails with food, even if they don't realize it. It can be as simple as a dry martini with grilled sea bass or a French martini with a chocolate mousse. The key is to complement the food while avoiding an exact match. You can do this by thinking about the flavors in your food and what else you might eat with it. For instance, raspberries are fantastic with chocolate, which is why the Chambord in the French martini would be a good fit for a chocolate chocolate. 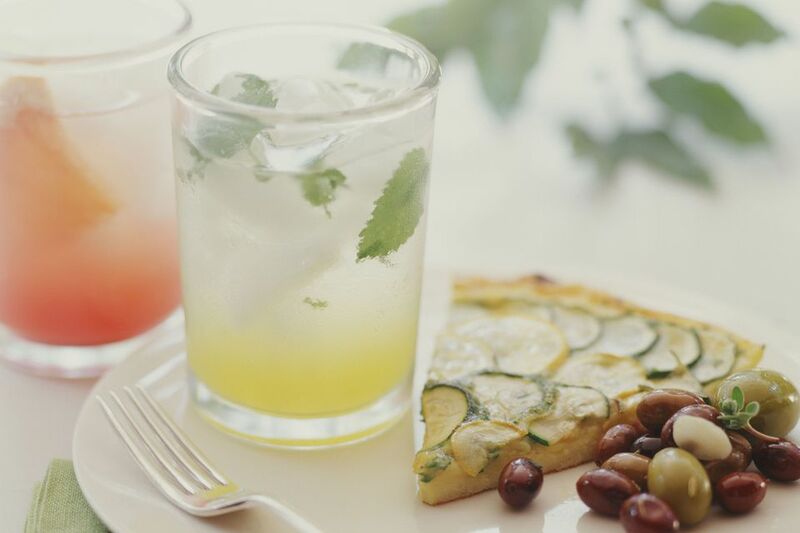 The drink includes pineapple as well, and that brings in a tart contrast. While it's tempting to shake up a decadent chocolate martini for that same mousse, it would be too much chocolate. If each element has the same flavor, it takes away from the experience. Complements and contrasts are the way to go for pairings because they keep your senses invigorated and looking forward to the next bite or sip. You do not have to step far from tradition when it comes to dinner-worthy cocktails, either. If you desire a wine pairing, wine cocktails can be a nice alternative. Even simple recipes like a white wine spritzer or a kir can add a special touch to a meal. The beauty of a cocktail pairing is that you can match bold flavors with subtle foods and vice versa. Melkohn Khosrovian of Greenbar Distillery suggests that if you are working with a soft-flavored duck or fish, pull out a strong, flavor-filled cocktail. On the other hand, if you have a spicy Asian dish, you will want to go with a light, airy, refreshing cocktail. Keep in mind that the mixed drink can always be tailored to fit the need. You will win some and lose some when it comes to pairings, no matter which beverages you choose. Simply have fun, think through your taste buds, and, as Khosrovian says, "don't match, complement." If you have attended Tales of the Cocktail, you may have experienced one of the event's signature "spirited dinners." This is the ultimate in food and cocktail pairings, with full course meals at some of New Orleans' top restaurants. For each course a mixologist and chef work together in the same way sommeliers and chefs have for years, matching flavors of food and drink together. That concept is a little extreme and not for the average dinner party, yet it is a fun experience and a highlight during the annual cocktail conference. While one cocktail for each of five courses sounds like a great way to start an evening, it is a lot of alcohol. Serving sizes for full-spirit dinner pairings should be smaller, made up of only 2- to 3-ounce cocktails. Your table setting will also look better with petite old-fashioned glasses instead of the 6-ounce styles that are so common. For a more subtle pairing scheme, mix beer, wine, and cocktails on the menu. For example, you may want to serve a nice aperitif cocktail with the appetizers and a refreshing beer with a course or two. Then, select a wine for your feature dish and go back to a delicious dessert cocktail to top off the evening. If you have been pairing wine and food, you may have a good feel for it. In comparison, cocktails may seem intimidating because of the misconception that cocktails dull the palate and overwhelm the food. However, it is just the opposite. Khosrovian points out that wine will coat the palate, where spirits actually absorb fat and “wash the palate.” This is especially poignant with rich, fatty foods like foie gras because the higher alcohol content actually cleanses the palate and prepares it for the next bite or course. With wines, it's best to have extensive knowledge of styles and characteristics in order to create a proper pairing. You might know that a Riesling is the most versatile and that red wines tend to go well with red meats. Beyond the basics, one needs to understand a particular wine’s properties to create a truly spectacular pairing. Cocktails also allow you to pair individual and background flavors with elements in the food. It's not common to find the flavor of mango, blackberry or tea in a wine, but you can easily create a cocktail with any of those. With cocktails, it's often best to think of smaller portions for smaller dishes. These are often richer, more flavorful foods and your cocktail flavors can be more concentrated and fine-tuned to the individual dish. By keeping both elements small, neither is overwhelming and you can really savor the tastes. It is also a good idea to pair cuisine with spirit origin. A sake-based cocktail like the saketini, for instance, would be a nice fit for Japanese cuisine, including sushi. Likewise, look first to tequila with any Mexican-inspired meal and brandy with any French cuisine. There are always exceptions and some things are universal. Vodka, whiskey, and rum are good bases for most pairings as long as the complementary flavors do just that, complement. Your first cocktail dinner can be intimidating. Rather than offering your guests a pairing that may or may not work, do some experimentation beforehand. It's often best to attempt pairings on a small scale first, then bring them out for larger groups. You can do this with any meal you cook at home. Come up with a cocktail to serve with dinner and see how you like it. If it doesn't work out, no one outside your house will know! Once you get a winning match, take notes, then share it next time you have friends, family, or colleagues over for dinner. You can also use your restaurant dining experiences to experiment. You may not always get the hand-crafted cocktail experience you want, but it will give you an idea of tastes, flavors, and pairings. Anytime you are at a restaurant of any kind, browse their cocktail menu. If they don't have one, ask your server what they would drink with the food or what the chef would recommend for a good pairing. Take this insight home to create your ideal pairing. There are no right or wrong answers, though you will experience a few bad pairings along the way. The key is to experiment, learn from experience, and relish the adventure. After all, both food and drink are supposed to be enjoyable, so shake up a drink and see what happens!